The curing conditions play an important role in the quality assurance of composite products. Especially as composite materials are widely used in high tech areas so that they are required to fulfil high quality standards. Some problems which occur during curing, for instance undercuring, can hardly be detected using standard NDT investigations, mainly because they are manifested only at high temperatures, particularly close to glass-rubber-transition. On-line cure monitoring has the outstanding advantage that it can monitor the material parameters even at the highest temperatures possible. In recent years cure monitoring with ultrasonic methods has become more popular . In comparison to dielectric methods mechanical parameters are measured directly. The quantities to be measured are the velocity and the attenuation of the sound wave. On this basis the storage and loss modulus can be calculated. Depending on the form of excitation with longitudinal or transversal waves these moduli are referred to as long wave or shear modulus. Well developed computer based technology and sensor materials are available in the non-destructive testing (NDT) market. The measuring equipment employed a commercial NDT system, which worked computer-aided. With a special software the demands of automatic operation under industrial conditions was accomplished. This measurement equipment was tested on composites. Its structure, performance and some practical results will be presented in the following paper. An essential requirement for the industrial application of such a monitoring system has been the commercial availability of the most important components from the NDT technology. Therefore the used measuring equipment is based on an ultrasonic measurement device USLT 2000 (fig. 1). 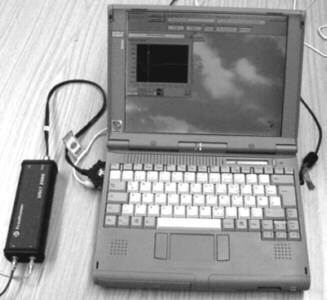 It consists of a laptop, pulse generator and amplifier (blue box). 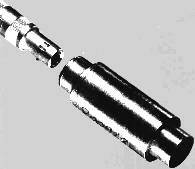 The used ultrasonic sensors (fig. 2), developed at the BAM are based on temperature stable ceramics. Their Curie point is near 500°C. Therefore they work reliably at temperatures up to about 200°C without depolarisation. The ceramic resonator is damped in order to obtain short distinguishable pulses. In the meantime these sensors are commercially available. With this equipment the delay time and the attenuation of the signal caused by the material has been measured. For that the through transmission technique was used. That means a short high voltage pulse, launched by the ultrasonic generator, causes the emitter sensor to send out an ultrasonic pulse. After this short pulse has passed the moulding compound it is received by the second sensor. Amplification and digitisation follow. By this technique the first part of the measurement signal yields all information about delay time and attenuation without any distortions caused by reflections, because their delay time is longer. In order to determine the pure travelling time through the composite material firstly a comparison signal has to be determined, which is obtained when there is no compound in the mould (fig.3a). fig. 4 shows its signal form and spectrum. Secondly a polymer material is filled into the mould and the actual measurement takes place (fig. 3b ). The difference in measured delay times is caused by the polymer material. This technique has the advantage, that you need not know the constructive details of sensors or tool, in order to obtain the delay time material of the polymer material. In the production the measuring system should work fully automatic and therefore manual setting or adjustment of signal detection or analysis parameters should not be necessary. Hence the measurement signal must be reliably detected even when its delay time is changed during the cure process. A peak detector with a fixed measurement window cannot achieve this. To add to this problem the reflections, which follow the measurement signal within a very small time period, can have higher amplitudes due to constructive interference. This further complicates location of the correct peak. A crosscorrelation function is fitter for the determination of the signal position in the A-scan. Thus the comparison signal and the actually measured signal are crosscorrelated. Then the first maximum of the crosscorrelation result yields the difference of the delay times. The further following maximums are caused by reflections. Because the delay time and the amplitude must be measured very exactly, the surrounding of the signal's location as determined by means of crosscorrelation, has been modelled by a sinus oscillation with high point numbers. In this region the delay time and the amplitude of maximum ( or minimum) peak is measured. This way the delay time precision of +/- 4 ns is reached. If the thickness x of moulding compound is known, the sound velocity v can be calculated from v = x/t. If the acoustic pulses base of longitudinal waves, then M* = L * is the longitudinal wave modulus. For transversal waves M* = G* is the shear modulus. In the following the paper will generally be restricted to the sound velocity. In most many cases the variation of the longitudinal sound velocity is proportional to the variation of the real part of the longitudinal moduli: D L ~ D v, if D v2 <<v2 . The performance of the described ultrasonic cure monitoring system is illustrated by the cast resin RTM6. Measurement results, which were obtained from thermoset moulding compounds, are reported in . RTM6 is a widely used resin for resin transfer moulding (RTM) technology. The process starts with the liquid resin which is injected into a hot mould at a predefined temperature (160°C). As the mould fills first acoustical contact is achieved between sensor and resin and the measurement of sound velocity and amplitude begins. The resin passes through the well described  phases from liquid via gel to solid. The curves of fig. 5 mirrors the changes of the mechanical properties of RTM6 during the curing process in the form of sound velocity and attenuation. At the end of the experiment the reaction has come to an end or is frozen under these moulding conditions . Until reaction begins, the resin remains in a liquid-like state which explains the low, almost stable sound velocity before a sufficient network structure is formed. A detailed analysis of this behaviour, especially the correlation between sound velocity and state of the material is given in . The attenuation curve has a pronounced maximum. It appears, when the product of the relaxation time and measurement frequency is near unity. At first sight the behaviour of transversal wave velocity and attenuation is very different. Because acoustical transversal waves cannot propagate through liquids, the transversal signal isn't seen till 3800 s. It appears when the crosslinking process is very advanced. That is the reason why longitudinal waves are preferred for cure monitoring. In the manufacturing of composite products the producers often try to maintain constant the optimal process parameter and deviations will effect the quality of the final product. Cure monitoring allows the producer to observe cure directly and can be employed to help set optimal process parameters or to change parameters during the process in order to achieve the intended final material properties. Also it provides a record of quality for individual articles. For this purpose the producer has to know the influence of technological parameters on the curing. Such investigations on thermosets moulding compounds were already published . In the field of composites such parameters could be the temperature, the ratio hardener to resin and ageing of input materials. For example fig. 6 shows the temperature influence on the curing of cast resin RTM6. The curves shows the known behaviour (compare with fig. 1). With the help of this figure it is possible to determine quantitatively, how the curing time becomes shorter, if the temperature increased. Motive for investigating of epoxy prepregs is practical issue. The question had been asked- how does this material behave during cure and what is the final state of cure under certain curing conditions. Thus its cure behaviour was investigated by ultrasonic monitoring. The investigation was slightly different to that of cast resin. Because the prepregs were highly filled with fibre material their surface was uneven. Therefore it was hard to obtain good acoustical contact, especially when the material is at room temperature and only low pressure is applied to the prepregs. Additionally strong scattering effects caused by the fibres could disturb the measurements. On the other hand the cure behaviour should be similar to that of the cast resin. The sound velocity shows the expected behaviour in both figures. Note that the attenuation is rather high in the beginning. It is probably caused by the acoustic contact, since the sound velocity is regular in the same range. When the prepreg is heated the acoustical contact is improved and the attenuation decreases. After about 500s the attenuation curve follows the normal cure profile. Also scattering effects aren't a problem. This behaviour is valid for both prepreg materials. The measurement of prepregs with carbon fibres are rather complicated to handle, because the material is very thin. Nevertheless the measurements were successful. The ultrasonic cure control is based on a stable physical foundation. It yields reliable results about the cure behaviour of different materials. With the aid of this technique many practical problems could be solved. For instance the dependence of cure behaviour on diverse process parameter can be determined. Last but not least the production process can controlled automatically. Recent results from industrial trials have been very positive. Babayesky P. G., Gilham J K, J. Appl. Polym. Sci.,17, 2067, (1973).